Republicans Have God On Their Side: Infinite wisdom! I always heard Coulter had an Adam's apple, but until now disbelieved. 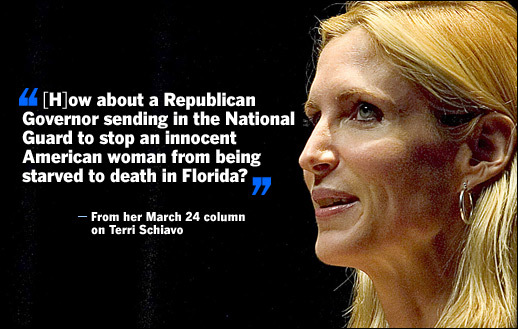 How does Ann think the Republicans lost so soundly yesterday? After all your arrogant bravado, it's clear the majority of the American people disagree with many things you think. We are all Americans, in this together. Stop being so divisive and maybe folks will be nicer to you. Liberals are not bad people. Hope you enjoy Speaker Pelosi and Majority Leader Reid. Kennedy will chair a committee, and Conyers, and Dingell, and Wexler, oh my. Goodbye John Bolton. Goodbye Rummy. Now we get to try cooperation. By the way, I extend my sympathy re: the election; I know how it feels, you know. And no matter how bad it appears, it'll be fine. Again, I should know. figure out a way to archive posts, so they don't all pop up every time. It takes forever to download when you don't just keep recent things. You'll get more return visitors; though I can't vouch for their mood or civility. And keep posting. We all have something to say, and I have found you interesting, even if we only sporadically agree. Just because I am not a Christian does not mean I don't think God created all this. The creation is the word of God, in my eyes, and we make of it what we will. My online friends propose this link to use -TOP10 - As for me,........ I think life is now!! !